I have a custom 1998 Harley Fatboy for Sale that has a Screaming Eagle kit, dry bag and a Harley Davidson motorcycle helmet. 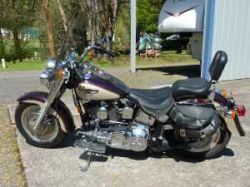 The 1998 Harley Fatboy 95th Anniversary Edition for Sale only has 13,600 miles and is priced to sell at only $11,500 plus you get the dry bag and the Harley helmet in the deal. I have $22,000 invested in customizing the 1998 Harley Davidson fatboy for sale and my asking price of only $11,500.00 makes this a real bargain for some lucky biker. The used Harley Davidson for sale is located in foster Oregon and if you are interested in making an appointment to take a look you can contact me, Terry, using the comments form found directly below this classified. Strike Lightning Used Motorcycles for Sale would like to invite anybody who may be having problems with their 1998 Harley Davidson Fatboy to leave their questions with a description of the exact problem that have been having or what you need to repair and your contact information in the space below and see if somebody who stops by may offer a solution for how to fix your motorcycle and the same goes if you would like voice your opinion by writing a review of The 1998 Fatboy. We encourage you to submit your opinions and write a review of the 1998 Harley Fatboy for Sale for sale if you know a thing or two about it, not to kill the cruiser's reputation or to give it a horrible rating but to help potential buyers make informed decisions and to benefit the biker community as a whole.